Mirror image in Adobe Photoshop is classified as a special case of the arbitrary transformation. However, in several sections editor menu placed two separate strings of commands to mirror images in two planes (horizontal and vertical). There are several ways to access these commands. 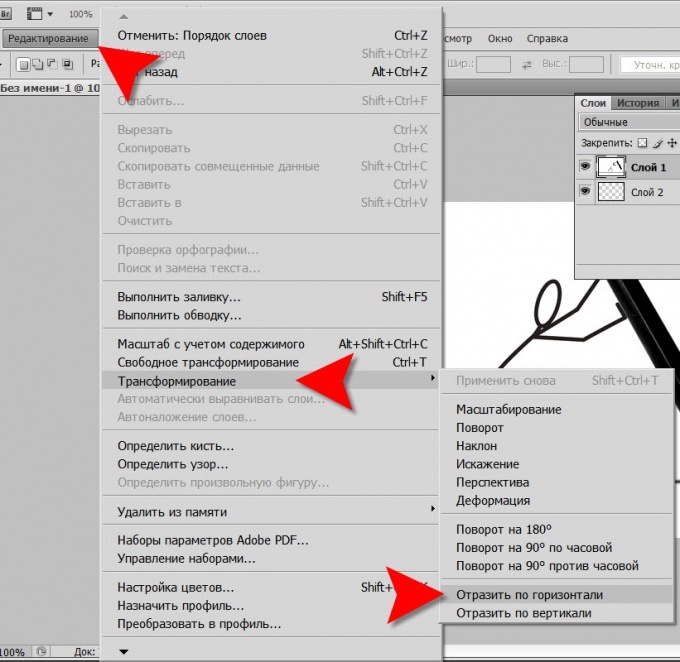 Open the menu of the graphic editor section "Picture", if you want to mirror the entire document as a whole, including all graphics, text layers, masks, etc. 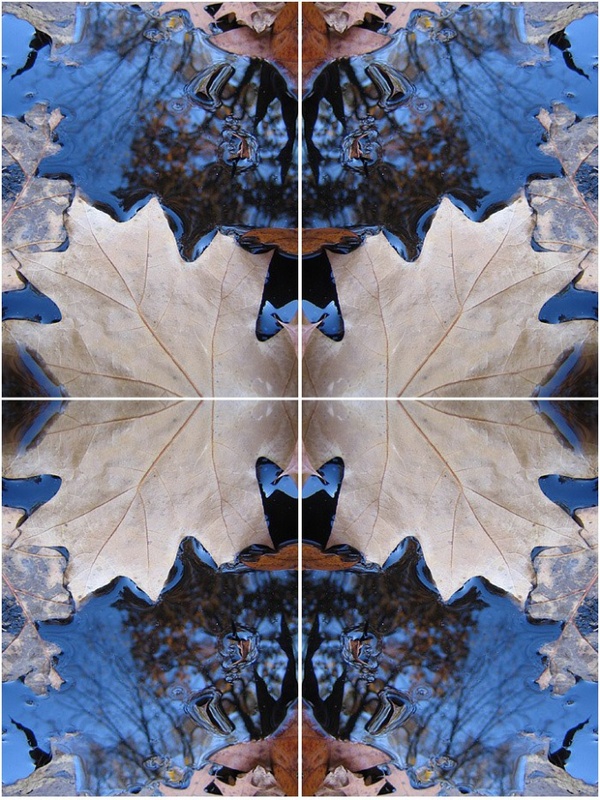 In this section, go to "image Rotation" and find where the two teams mirror - Flip canvas horizontal and Flip canvas vertical. 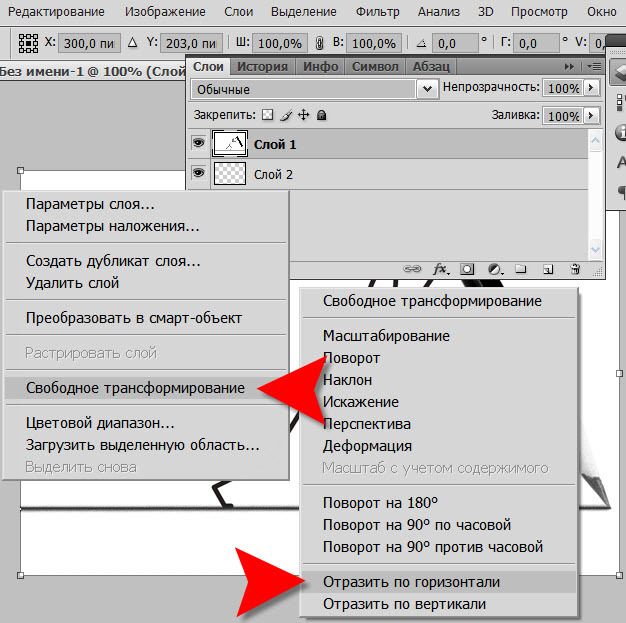 Select one of them, and Photoshop will carry out the necessary transformation of all layers of the document. Click in the layer palette you need if the mirror is required only its contents, not the entire document. Then open in the menu "Edit" and go to "Transform". It contains more tools of transformation than they were in the list of the relevant subsection in the "Image" section, and you need the command "flip horizontal" and "vertical flip" and then placed in the bottom of the list. Click and the image in the selected layer will be reflected in the appropriate plane. You can use the alternative steps described in the previous step. For that too you must first select click the layer you want to mirror. Then you click on the keyboard button M to turn the tool "Rectangular area". This can be done by clicking on the appropriate icon on the panels toolbar. Then right-click the image and in the popup context menu, select "Free transform". Around the outline of an image that layer will appear with the nodal points, but you have nothing to do with it is not required, and it is necessary to click the picture again with the right mouse button. This time the drop-down menu will contain all those items that you saw in the section Transform in the previous step, including the desired "flip horizontal" and "vertical flip". Click with the right direction of mirroring. To reflect the image horizontally or vertically in almost any program for viewing images. But it very often spoils the overall quality of the source file. To avoid this, it is better to use graphical editors. For Example, Adobe Photoshop. Using the tools of photoshop can quickly make mirror reflection pictures, but also edit it to obtain the desired result. Open the image in photoshop. To do this, use the command "File – Open..." and browse to the location of the required images. Or just drag the image from the folder directly to the program by holding the file with the left mouse button. Click "Image – Rotate canvas..." and then choose your function: "flip horizontal" or "vertical flip". If you don't want to do, save the picture in good quality, with the command "File – Save" or "File – Save as...". If you want the original image and its mirror reflection were on one picture, you will need to create additional layers and change the canvas size. Right-click on the only layer present at the moment in the file. First, select menu "From background...". This command will make a layer with the picture is not background, not linked to further action with the image size. Then select "duplicate layer...". Now, depending on vertical or horizontal mirror you want to increase two times the height or width of the working space, respectively. Use the command "Image – canvas Size". After that, select the layer copy and reflect it in the right direction. With the mouse drag the layer so that it stood next to the original imagem. When the desired effect is achieved, save the image. To mimic the reflection of the original image on water or other surfaces, you will need to give the realism of the resulting layer. For this you can experiment with the layer transparency and blending modes; apply various effects ("Filters"); to deform and change the perspective (the command "Edit – Transform"), etc. In the artificial creation of a reflection guided by the real images. 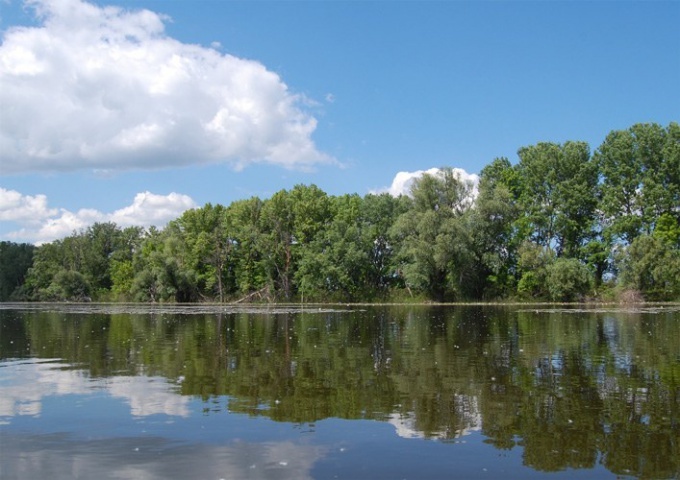 For example, if you need to create a reflection effect on the water, view some photos, which show the items reflected on the water surface. After reaching the desired effect don't forget to save the image. To create the basis for mirror reflection of an object in Photoshop using the options Flip Horizontal or Vertical. Additional processing of images is to change the transparency and shape of the reflected layer. Upload the picture to which you wish to add a reflection, in the graphics editor. Unlock the image by double-clicking on the icon that looks like a castle on the background layer and duplicate the layer with the Duplicate Layer option from the Layer menu. The default canvas size for the document size matches the size loaded in Photoshop pictures. In order to document enough space on the reflection, increase the canvas size by going to the settings option Canvas Size menu Image. Select percent as the unit and check the Relative checkbox. If you are going to flip an object horizontally, increase fifty percent the width of the canvas. In order to place a copy of the image, reflected vertically, insert a value equal to fifty percent, in the Height field. Apply to the copy source layer the option Flip Horizontal group Transform Edit menu, if the plane in which the reflected object is located to the side of it. To reflect vertically, use the Flip Vertical option from the same group. If necessary, hide parts of layers that should not be visible in the final image. To do this, add to each of the copies of the pictures of the mask by clicking Add layer mask and select the area to be transparent, Rectangular Marquee tool or the Polygonal Lasso. Fill with black color mask in the highlight area, applying Paint Bucket Tool. Make remote from the object of the reflection more transparent, applying to the mask a gradient. 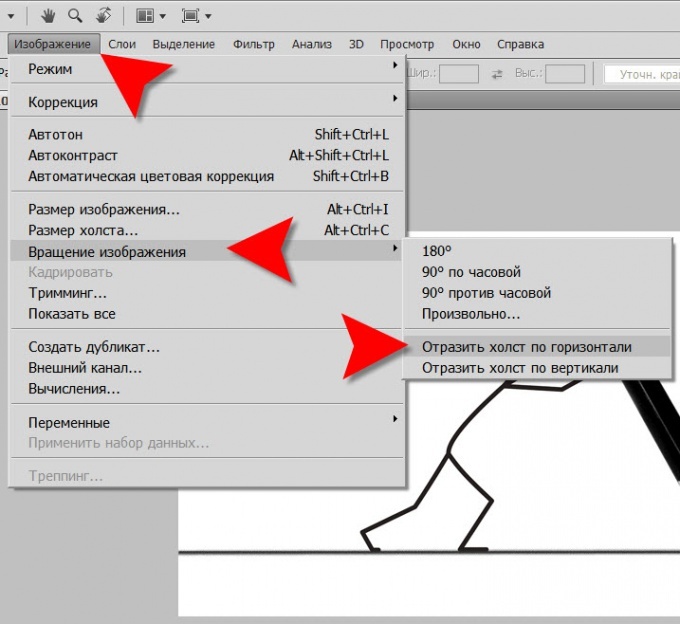 If you have already edited the mask on the layer with the reflectionm, I load the selection option, Load Selection menu and Select invert it with the Invert option in this menu. Turn on the Gradient tool and select from a palette of samples of the grayscale gradient. Fill the selected area of the mask with a linear gradient so that the white color was superimposed on a part of the reflection that is closer to the original object. If the scope of reflection, are close to the source became clear invert color gradient by selecting the Invert option in its settings, and refill the selected area of the mask. By clicking on the button Add a new layer, add to the document a new layer and fill it with a color, which needs to be painted reflective surface. If you simulate a reflection in water, can choose the background the darkest of the colors of the sky in the picture. Move created layer below both images. If necessary, deform the reflection to give the image more realism. If an object reflected in a convex or concave surface, change the form of the copy of the original layer group Warp option Transform the Edit menu. To create the effect of ripples on the water, apply the option group Wave Distort Filter menu. Save the picture with the reflection ofm in the psd file Save As option the File menu, if you're going to continue with the editing. To view save the image as a jpg with the same options.